Sheppard was the starting MLB in Buffalo OTAs alongside Nick Barnett at WILL and Kirk Morrison at SAM. This should stick and Sheppard should be an IDP steal this season as long as his hype doesn’t get out of hand. I consider him to be this year’s David Hawthorne and consider him to be a strong LB2+. Don’t believe anything you hear from Pete Carroll about Barrett Ruud and Bobby Wagner “competing” in camp for the starting MLB spot. Ruud was simply insurance in case the Seahawks missed out in the draft. They didn’t. Ruud will go back to where he belongs, on the bench. Dynasty leaguers should really pay attention as Wagner should pick up right where Hawthorne left off on a sneaky good Seattle D.
I’m admittedly in the minority in this but I’m skeptical of Kendricks value at his current ADP. Kendricks is ticketed for the SLB in the Eagles’ 4-3 defense. Not exactly an IDP- friendly position. If he were starting on the weak side, I think he would be in the argument for the first rookie LB to be taken. The best shot for Kendricks to live up to these expectations would be for the newly acquired DeMeco Ryans to fall on his face or get re-injured so Kendricks could slide over to the middle. If you’re in a deep IDP Dynasty league, take him, stash him, and keep your fingers crossed. In a redraft, there is better value out there. The key beneficiary to Miami’s switch to a 4-3 is Cameron Wake. The secondary is Dansby. Dansby will be a legitimate threat to breaking the 120 tackle mark this year and should easily produce LB1 numbers. I’m expecting a similar season to what we seen out of D’Qwell Jackson last year. Lawrence Timmons is an enigma wrapped in a question mark with some WTF sprinkles. Which year did we see the real Timmons, 2010 or 2011? Prior to 2010 he had never broken the 80 tackle mark, then exploded for 135. In 2011, although playing all over the formation due to injuries, he dropped back down to 93 total. His big plays suffered across the board too. 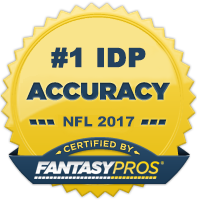 Every key IDP statistic dropped, INTs, sacks, FF, & passes defended. Timmons will get drafted early, but I cannot force myself to by into him as anything more than a mid to low range LB2 in a division that’s wanting to throw the ball more. If you have any questions, feel free to email Eric at ericolinger@idpguru.com or follow him on Twitter @OlingerIDPGuru. Also, feel free to post any questions or comments for Eric in the comments section of this post.